Megan Jennings and Jackie Young end up sharing the very last rental car when a snowstorm forces their plane to land in Montpelier. As they drive through the terrible weather, they pass over a covered bridge and are sent back in time to 1943. The women meet Jeff and Danny, two handsome soldiers about to head off to war. As Christmas approaches, can the girls return to their own time? Do they want to go home if it means leaving behind the men they love? 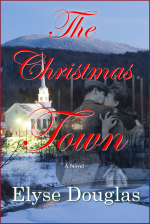 When reading The Christmas Town, it is obvious that the authors (the husband and wife team that comprise Elyse Douglas) spent a great deal of time researching the World War II era. Specific products are placed throughout the story as we learn which foods were available during war time and which things were sold in stores during the 1940s. However, I did have a couple of issues while reading this book. The first was that I never felt like the characters could be real people. Megan and Jackie appear to have completely flunked just about every grade from 6th through 12th, since neither of them had the slightest understanding of WWII. In fact, they had no idea when it started or ended or even which countries were involved. I also had several moments where one of the girls had a thought and I couldn't imagine any person actually thinking that thing in that specific moment. The other problem with this story is that the authors seem to suffer from telling instead of showing. It feels clumsy when an author inserts a giant chunk of description of a character or a setting and really interrupts the story without making the descriptions particularly memorable. This would be a stronger book if we learned about the characters as we took in the story instead of occasionally reading half a page of description. The Christmas Town might whet your desire for a Christmas themed story. It has plenty of snow and flirting and even features a sleigh ride. The characters feel unbelievable at times and the book is badly divided between description and story, but it would work as a light holiday romance.